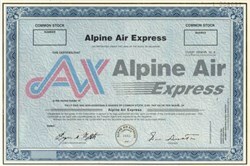 Beautifully engraved specimen certificate from the Alpine Air Express . This historic document has an ornate border around it with a vignette of the company's logo. This item has the printed signatures of the Company's President and CEO. Alpine Aviation, Inc. D/B/A Alpine Air has been in business since 1972. During this period the company has experienced steady growth. They operate a fleet of turbo-prop airplanes, that include 18 Beech 99 Airliners, 5 Beech 1900 Airliners with an option for an additional 5 Beech 1900 Airliners. Statistics show them as the third largest regional airline based on cargo volume as published in Air Transport World. They carry millions of pounds of mail yearly, servicing eight western States. They received their commuter Airline certification in 1982. In 2000 they ceased their passenger commuter operations and now operate on a scheduled cargo only operation. The First Officer training program has been in place since 1985. They have never had to lay off any pilots or mechanics since they have been in business.